An Indonesian ferry involved in a deadly mid-voyage fire on Thursday has sunk with several safety investigators, police and journalists on board. Medical workers said a TV cameraman had died, two people were seriously hurt and an unknown number are missing. It is not known how many were aboard when the Levina I ferry suddenly leaned over and sank off Jakarta's port. Earlier, the death toll from Thursday's fire rose to 41 after rescuers found 21 bodies drifting at sea, officials said. The BBC's Lucy Williamson in Jakarta says that the charred hulk had been towed to waters just off Jakarta's Tanjung Priok port so officials trying to uncover the cause of Thursday's fire could begin their examination. "It had been anchored at the time, but it was tilting on one side," Lieutenant-Colonel Hendra Pakan told the Reuters news agency. Medical workers at the port said a cameraman working for Indonesian television had been confirmed dead and another was in emergency care after being rescued from the sinking ship. An investigator who was examining the ferry when it sank was also said to be fighting for her life. Thursday's fire was the latest in a string of deadly transport incidents in Indonesia, leading to concern over its safety record. The Levina I ferry was 80km (50 miles) from port Tanjung Priok when a fire broke out. Some 250 passengers are known to have survived, but there are fears that some people are still missing. Navy officials said the bodies found earlier on Sunday were discovered by navy vessels and fishing boats. The previous figure for the dead was 20. "Some [bodies] were picked up directly from the sea by the warships while others were found by fishermen around two nearby islands," Indonesia's navy spokesman Lt Col Hendra Pakan told the Associated Press news agency. "They were all discovered about 30 miles (48km) away from the scene," the spokesman said. Navy ships are still continuing the search for survivors. Officials fear there could have been many more people on board than the 307 registered passengers, as Indonesian ferries regularly have stowaways, trying to avoid paying fares. 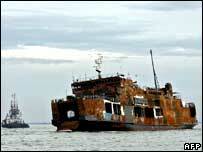 The Levina I was on its way from Jakarta to Bangka island off Sumatra when the blaze broke out on Thursday morning. Many of the survivors from the fire hurled themselves off the blazing vessel into the sea, to escape the flames. Yas Rijal, 33, was with his wife and son on the upper deck when the fire broke out. "Suddenly flames burst from the lower deck. The crew ordered us to put on yellow life vests and we jumped," he told the AP news agency. The accident is the most deadly sea disaster since a passenger ferry carrying around 600 people capsized in late December off Java island, killing more than half of the passengers. Indonesia, an archipelago of thousands of islands, relies on ferries to provide a cheap and extensive passenger network. But many vessels are badly maintained, and there have been a number of recent accidents. Indonesian President Susilo Bambang Yudhoyono has recently formed a team to look into transport safety.